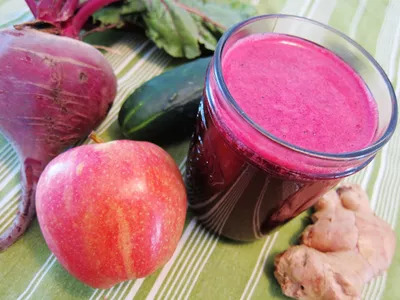 Brightly-colored juice seemed to be everywhere nowadays, and it's no wonder since it's such a nutrient-rich beverage. And, hey, a big glass of fresh juice can really hit the spot, right? With that said, here's a delicious recipe with a little zing (hello, fresh ginger!) that will make you feel a little bit healthier, starting with your very first sip! Brightly-colored juice seemed to be everywhere nowadays, and it's no wonder since it's such a nutrient-rich beverage. And, hey, a big glass of fresh juice can really hit the spot, right? With that said, here's a delicious recipe with a little zing (hello, fresh ginger!) that will make you feel a little bit healthier, starting with your very first sip! Directions: Combine all ingredients in a juicer. Pour juice into a glass or serve over ice.